Don't worry you don't have to answer how old you are but we'd sure like to know how old our readers are. Need to know your email addy so we can send you all sorts of cool stuff and updates ! We'd love to know how you found us so we can keep spreading The Little Red Riding Book love! Jenny and Jason are about to go on an exciting adventure – their very first riding lessons! When they arrive at beautiful Red Barn Farms, they are guided through the world of horses, with ever mounting excitement that they will soon be on the backs of their favourite horses, Percy and Amaretta. Before they sit in the saddle they learn about brushes, grooming, tack, safety rules are more. 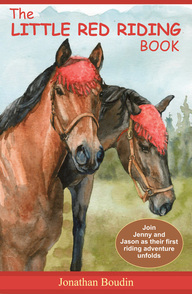 The colourful and entertaining cast of characters guides Jenny, Jason, and the reader through their journey; from the expert instruction of Mrs. Wallensworth to the quirky and comedic doings of Geeyo, the horse who is always getting into trouble. Most importantly, Jenny and Jason feel the bond and magic that happens between horse and rider. The Little Red Riding Book combines an entertaining and charming narrative with an educational twist. It delights and informs about the world of horses, and captures the excitement and joy of riding and being in the company of these magnificent creatures. The forty illustrations by Marti Adrian, including several detailed diagrams, bring the book alive and capture the real-life horses on which the story is based. Large print makes for easy reading. The Little Red Riding Book is a fun and educational adventure, but the element that is prominent throughout is the joy and the bond that exists between horse and human.